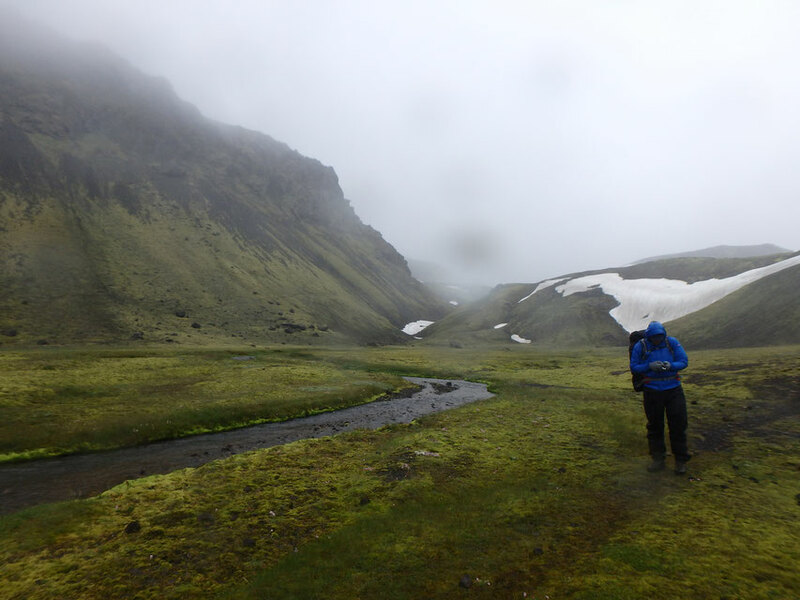 The morning started optimistically despite the rain and wind but, after taking off our shoes, socks and sometimes even trousers for the forth time as we crossed the many streams of Kaldaklofskvísl, we began to feel a little desperate. 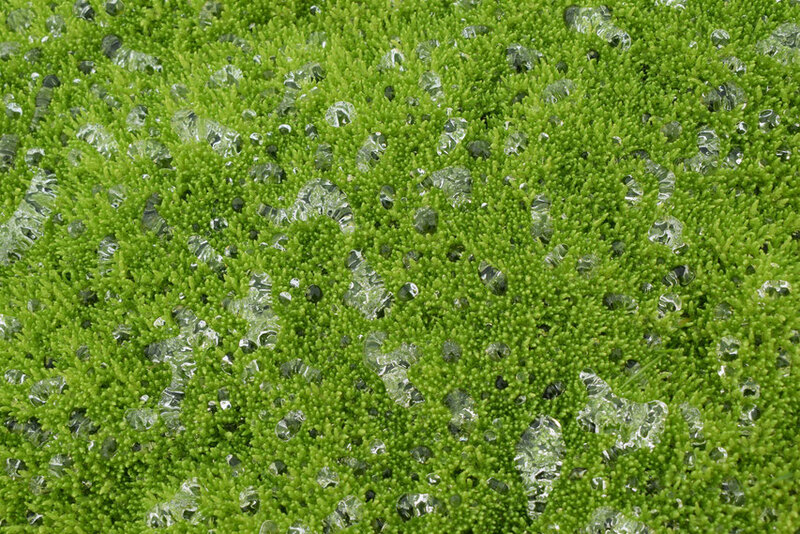 Soon we decided the changing was taking too much time and, our legs turning orange, we ran in our wetsuit socks* and underpants into the fog; through the seemingly endless, black, squishy sand and tiny freezing rivers. It was the most miserable and hilarious half an hour of my summer. *A better option would be wetsuit socks + sandals or westuit shoes as the stones were still sharp through socks. 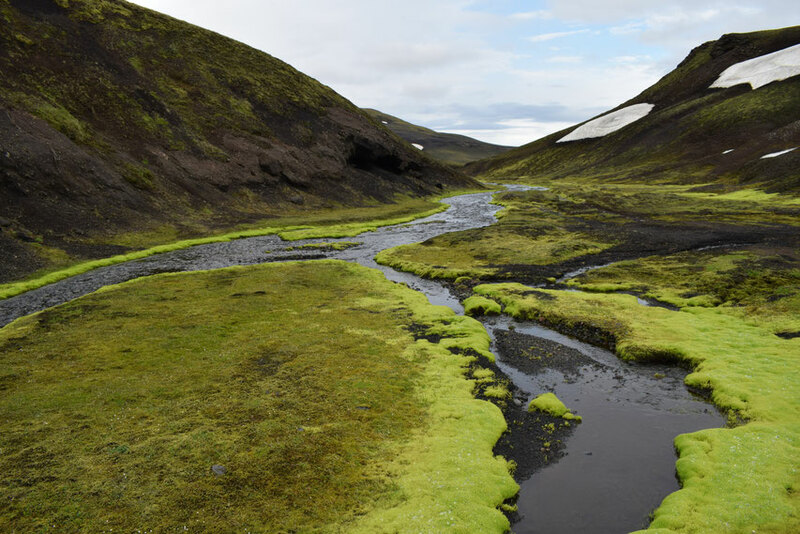 Once the fog had lifted - some of a great many small rivers approaching Strútskali. Arriving at Stútskali, we received a warm welcome from our friend Freya's mum (who we didn't know would be there). The highlands become a rather small place once you are working there. Not particularly early the next day, we walked the 5km north to Strútslaug. 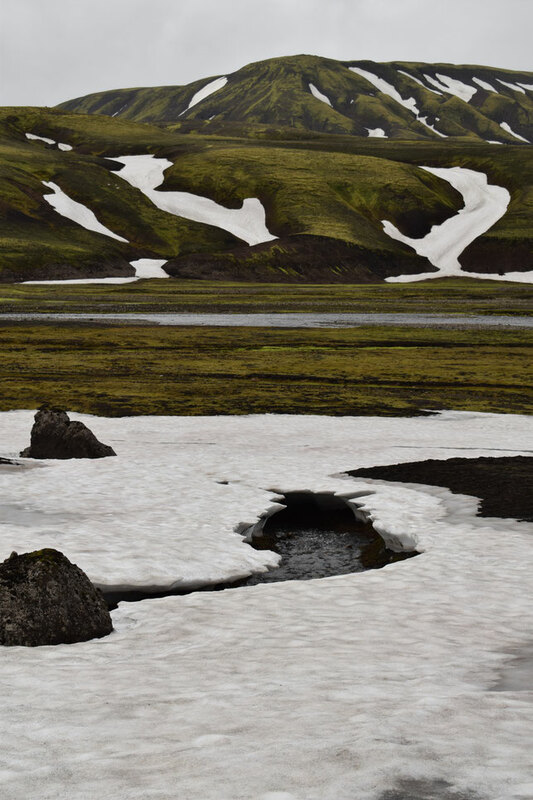 This natural hot pool is found in the valley Hólmsárbotnar (at the base of Laugarháls) and is only accessible on foot. The pools are deep and warm enough to stay in for as long as we liked. The peaceful soak was a very rare treat. 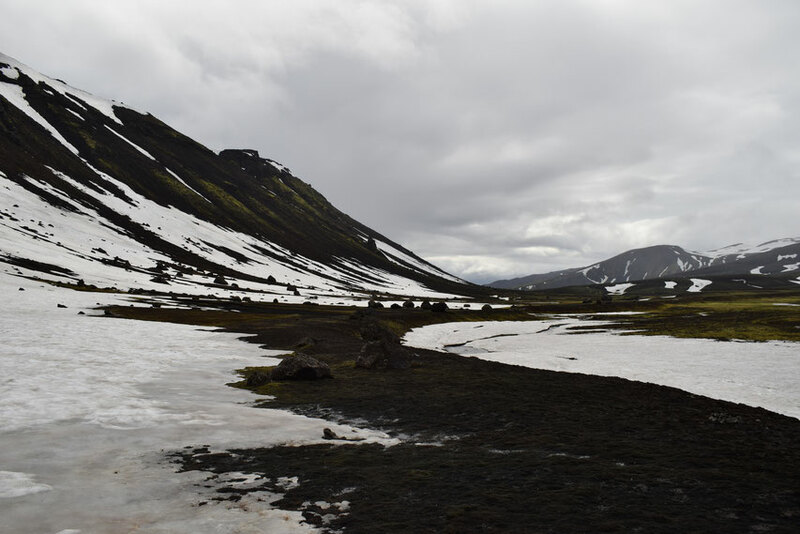 From Strútslaug, we made our way to the other side of the valley and began to skirt around the vast black mountain Svartahnúksfjöll. 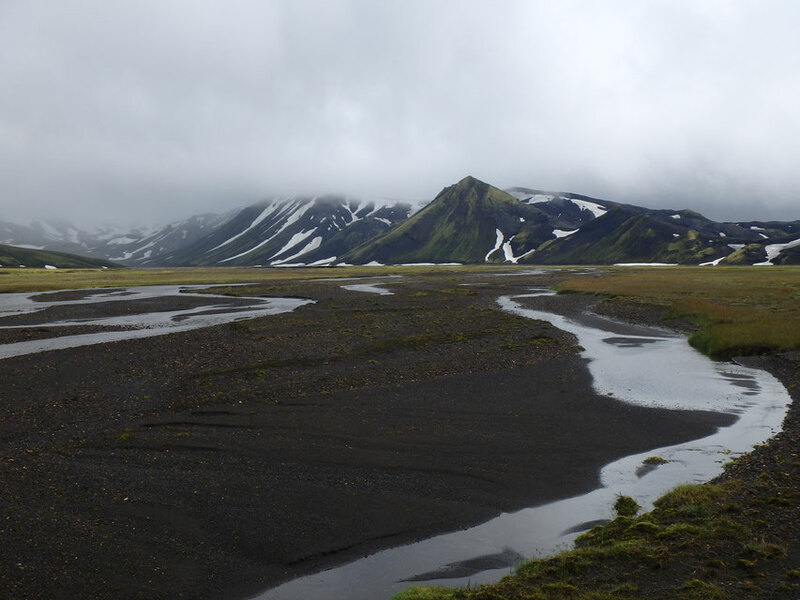 Looking back towards Strútslaug, Torfajökull behind. 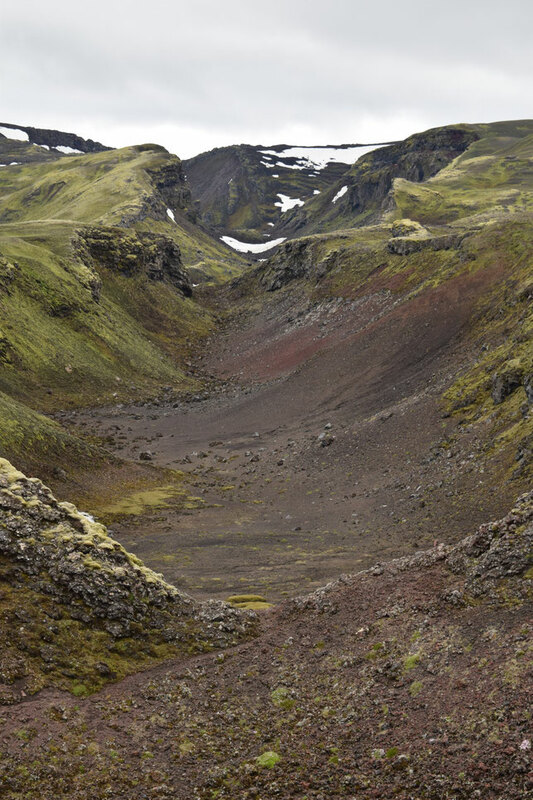 Svartahnúksfjöll - appropriately translating to something like - black mountains (left) and Ófærudalur. Ófærudalur - Dan refills his water. 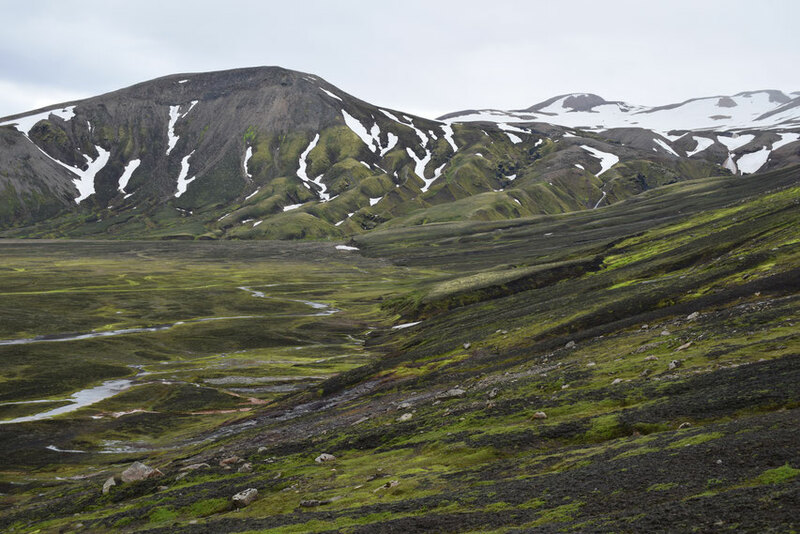 Svartahnúksfjöll is vast and it took us hours to walk around it. There was plenty of clean water to drink and, enjoying the lack of [much] wind and rain, we took breaks to eat and enjoy the new scenery. 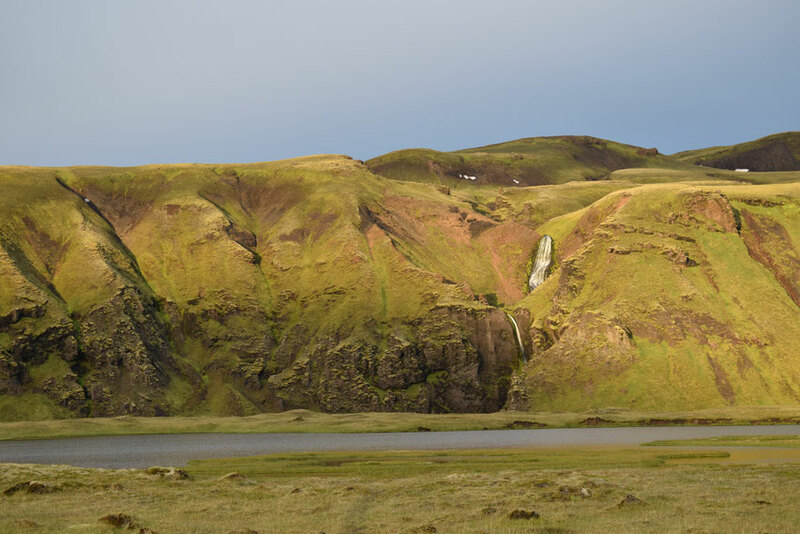 A small waterfall off Svartahnúksfjöll. 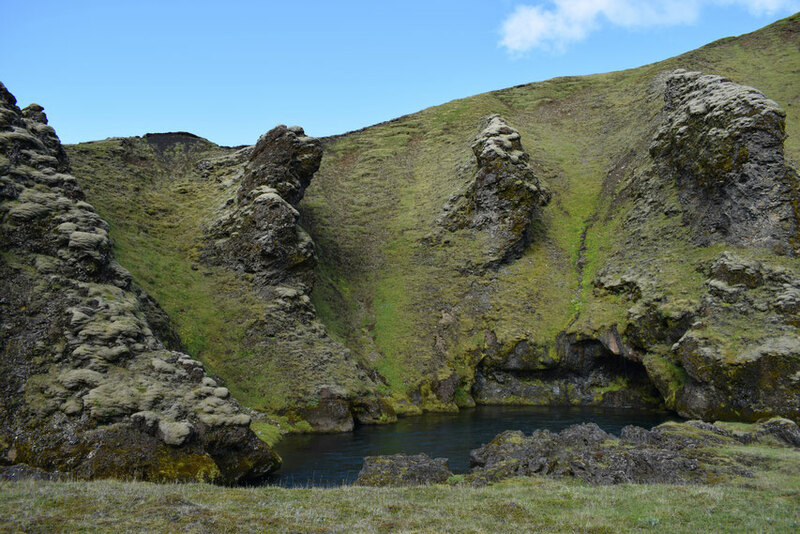 Part of Svartahnúksfjöll? 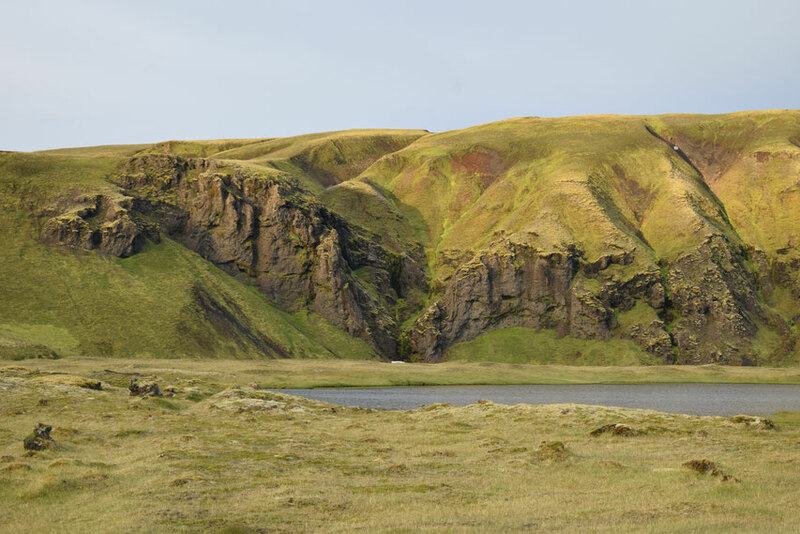 Somewhere between Ófærudalur and Álftavatnskrókur. 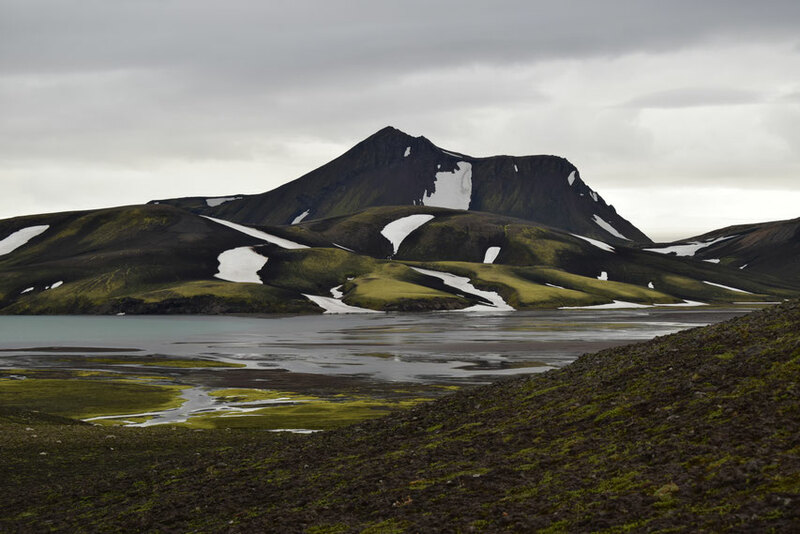 Eventually, we left Svartahnúksfjöll behind and began to cross rolling green hills, past a more southerly part of the famous Eldgjá fissure and into Álftavatnskrókur (a wide valley with several lakes and rivers). 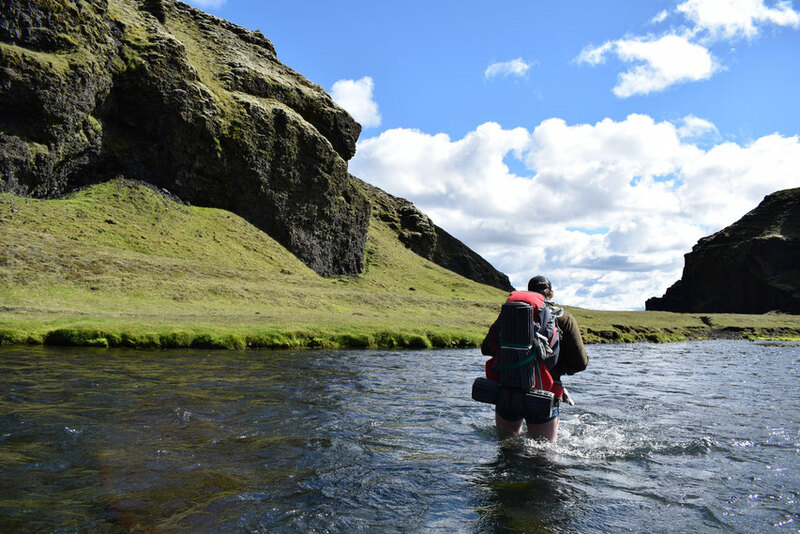 Our GPS route was a little confused at this point and we had become too lazy to follow the paper map for a while, so we ended up crossing Sydri-Ófaera river twice. 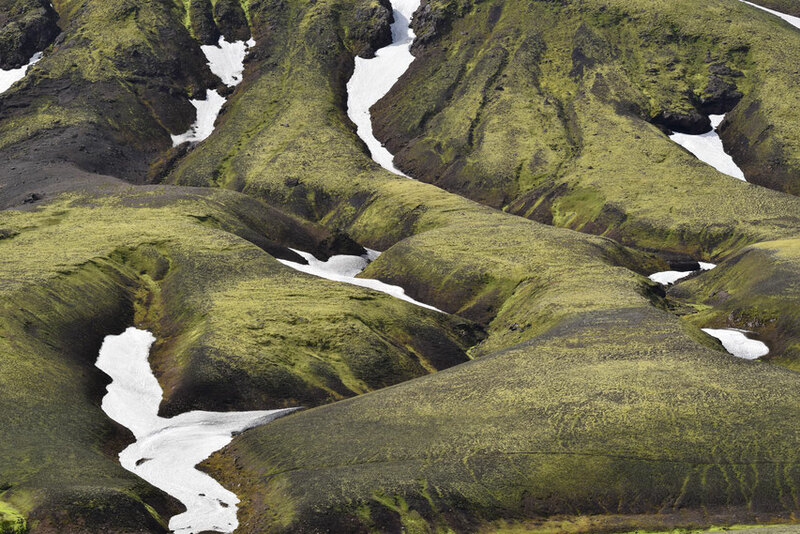 *Álftavötn (not to be confused with Álftavatn on the Laugavegur)! With each day we woke up to better weather. With only 6km left now and a whole day to complete it in, we left Álftavötn at a leisurely pace and enjoyed the sunshine. Though this stretch included the deepest river crossing, it was slow and not at all intimidating in good weather. I imagine it could be very different at another time. 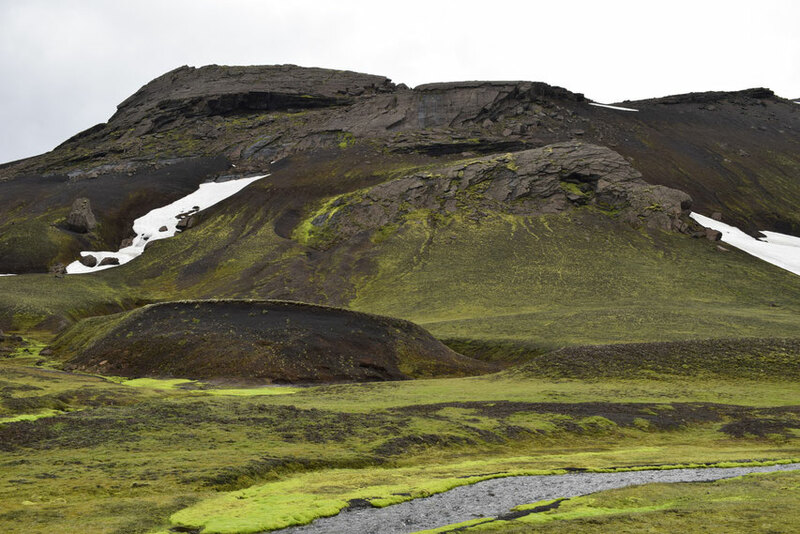 The final stretch through farm-land and moss-covered lava was flat and we were quickly at the end of our journey. 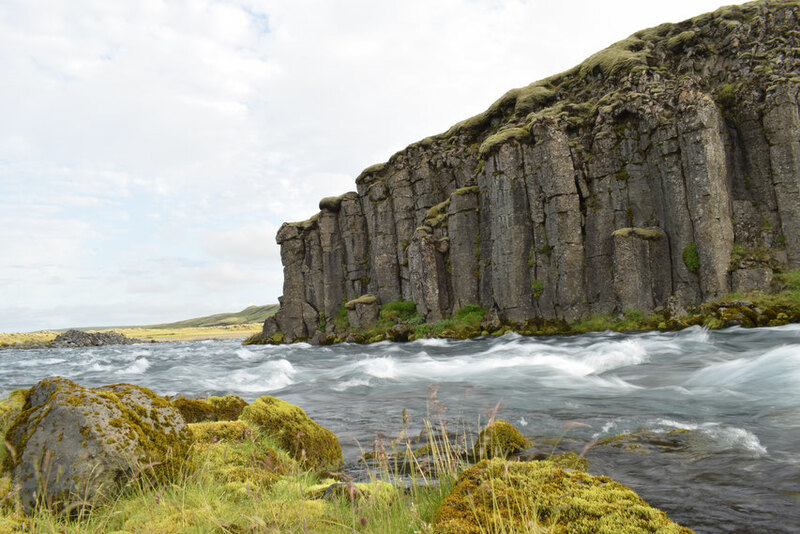 Syðri-Ófæra river passing through a canyon. 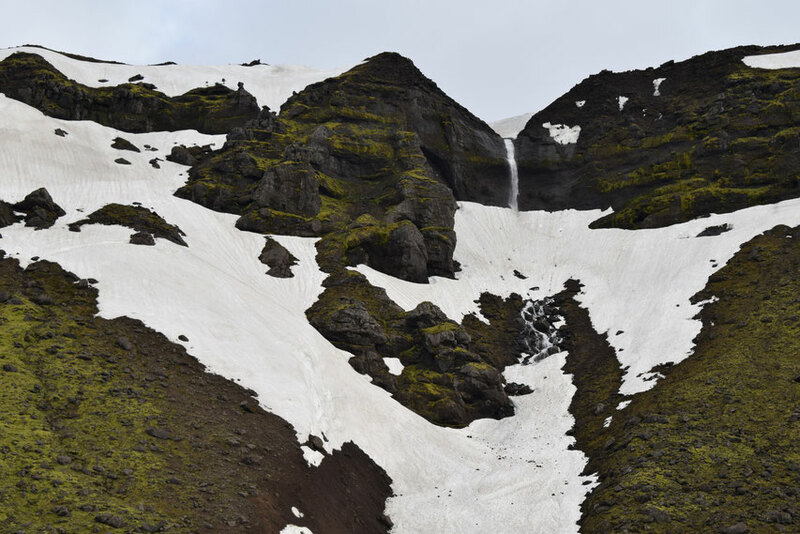 This route should only be attempted independently by experience hikers who have already completed some routes in Iceland. The best season for this hike is July and August. Though it could be possible ten days either side of this, you will probably find that there are no bus connections and generally more difficult conditions. 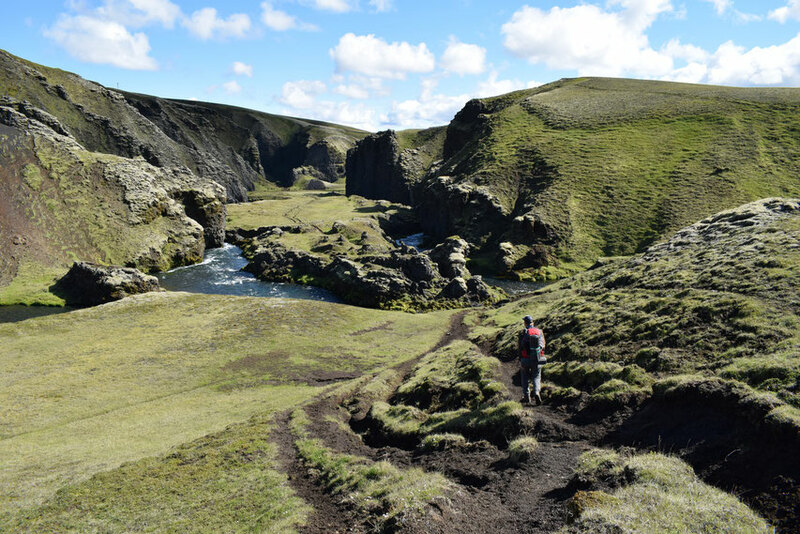 Strútsstígur is an unmarked path, hiked by relatively few people and far from any vehicle roads, so you must be entirely self-sufficient. 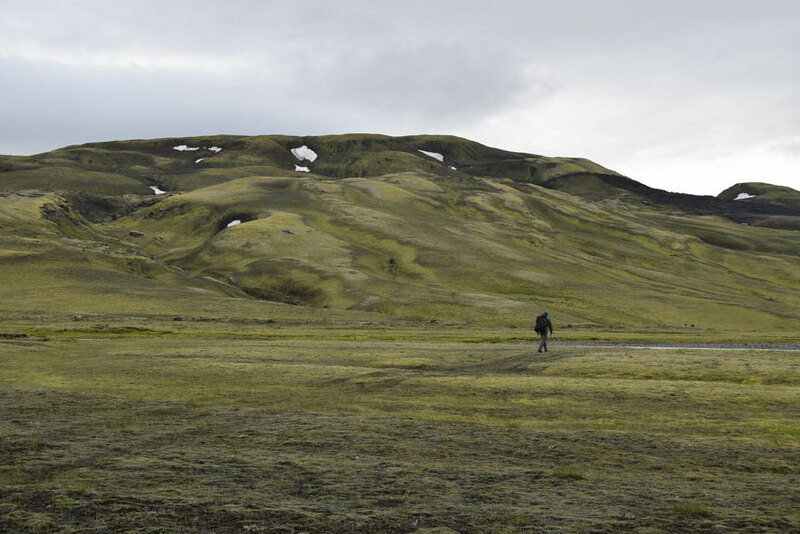 You will definitely need a GPS (loaded with the route) and plenty of extra batteries in addition to the other equipment specified in my Laugavegur packing list. It is also possible to rent a Personal Location Beacon (PLB) from Safe Travel (I would particularly recommend this for people hiking alone). You should take plenty of food and at least an extra day's worth in case of emergency. Register your travel plan (including as much information as possible) with Safe Travel, check the weather forecast carefully, speak to the wardens when you meet them and write your name in the guestbooks in each hut as you pass through. Though there is not a great deal of elevation on this hike, you should be fit/determined enough to walk 20km each day with your pack. Please only camp in the campsites and pay for the camping (or book yourself into the huts). Take all your rubbish (including toilet paper etc) with you. 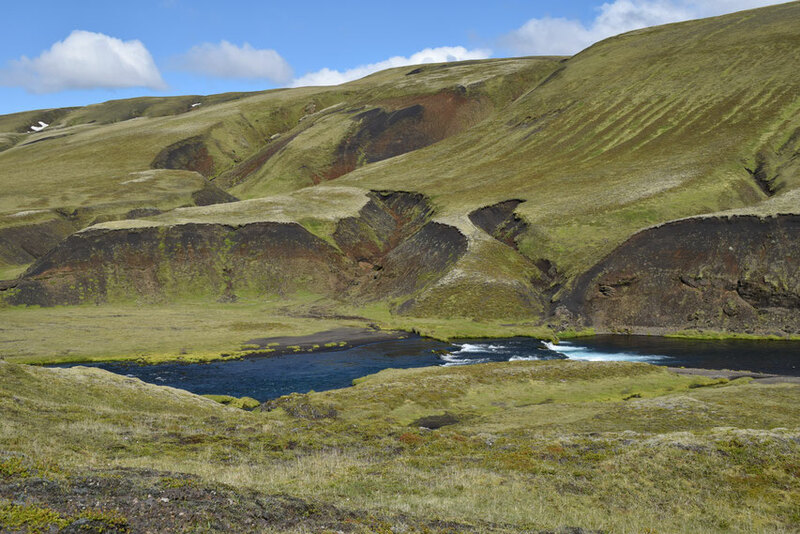 Hvanngil to Strútsskáli - 18km, negligible elevation, but very many (usually quite small) river crossings. Strútsskáli to Álftavötn - 20km, several river crossings. 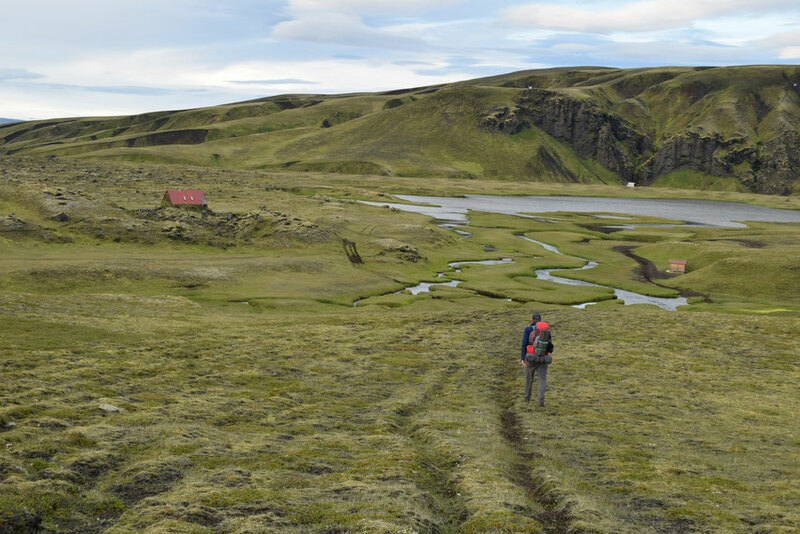 Álftavötn to Hólaskjól - 6/7km, the deepest river crossing on the trail (Syðri-Ófæra) reached over my bum, but was slow moving. 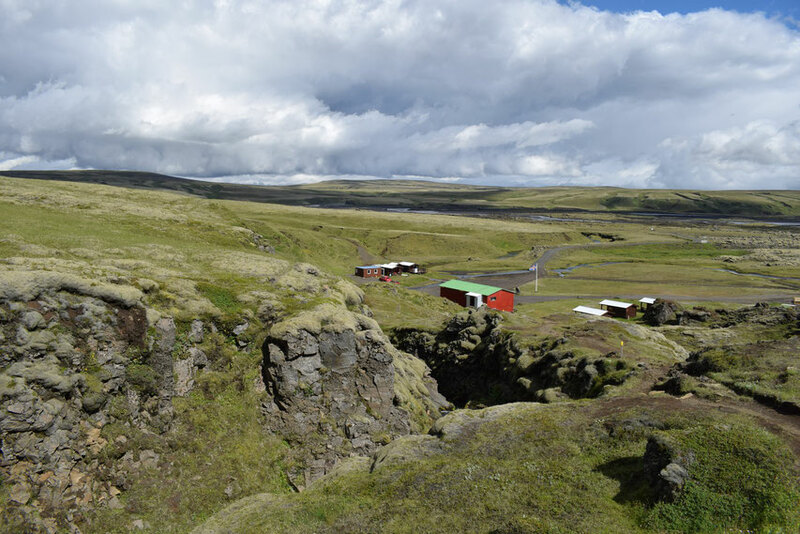 Logistics - transport and hiking to/from Hvanngil. 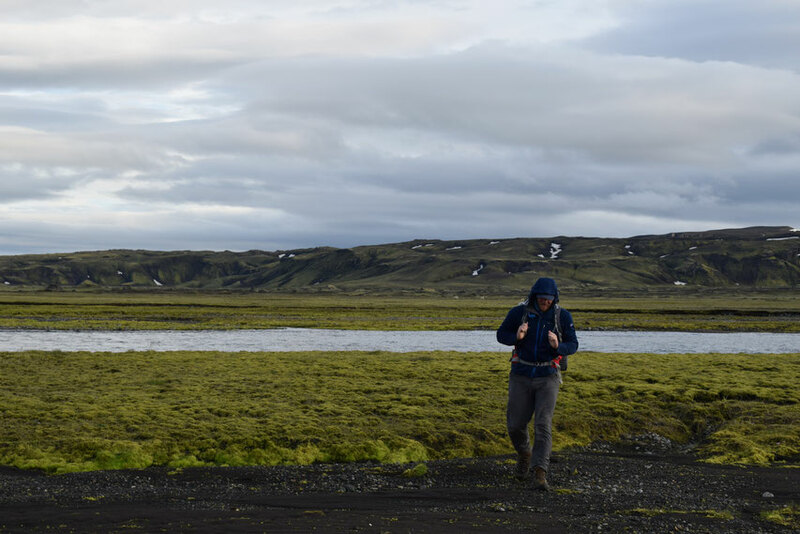 Transport connections from Hólaskjól are not easy to arrange once you arrive (we hitchhiked back to Landmannalaugar). 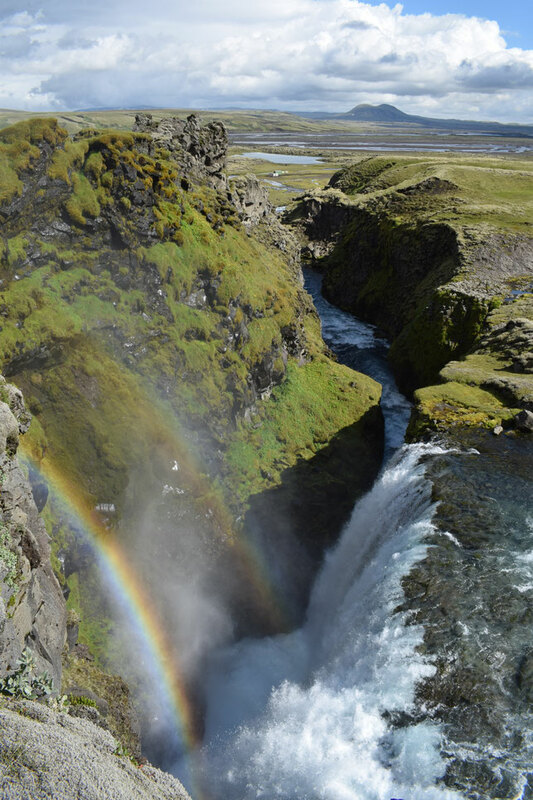 When planning your trip you should check which days and times the Reykjavik Excursions bus will stop there in 2019. This Summer, it was also possible to ask the TREX bus to stop there if you had pre-booked a ticket, but you should contact them in advance to confirm. 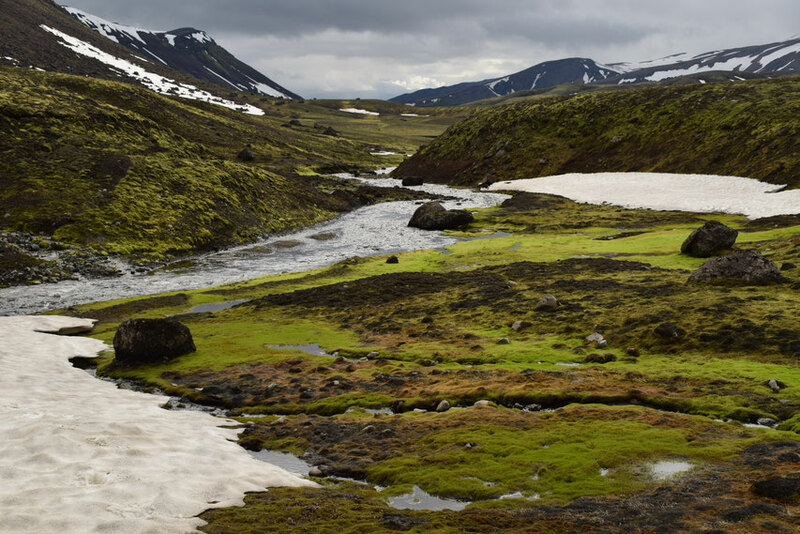 Calling the warden at Hólaskjól (nearer the time) would be a good way to check your options. 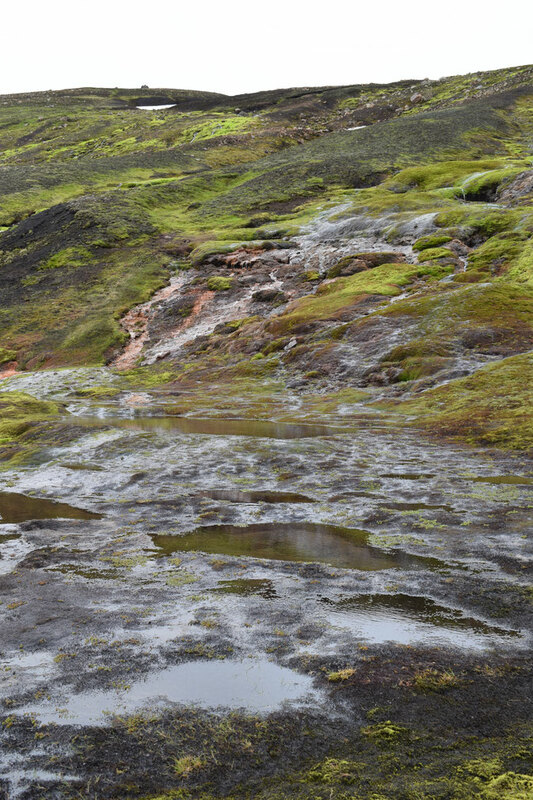 There are several ways to hike to/from Hvanngil. 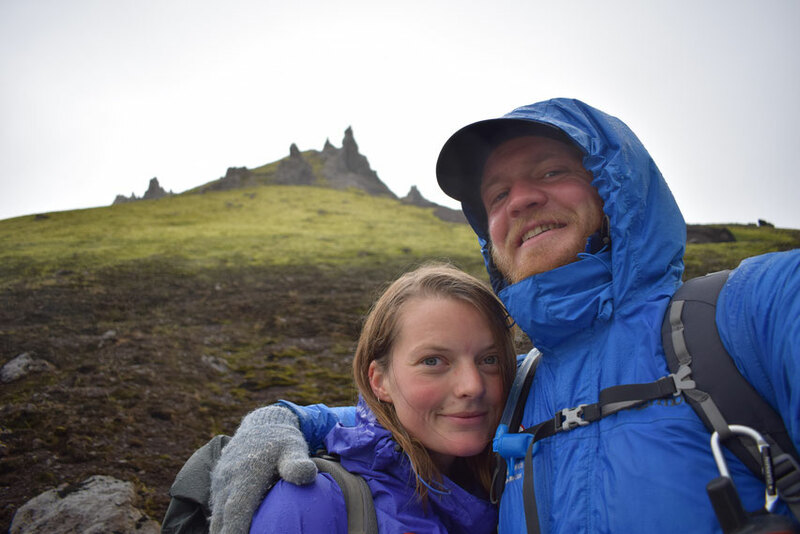 Dan and I started by hiking the Laugavegur trail [ <- please read the linked article for information] from Landmannalaugar, which can be done in one long day (28km) or two shorter ones (though it is not always possible to camp at Hrafntinnusker). 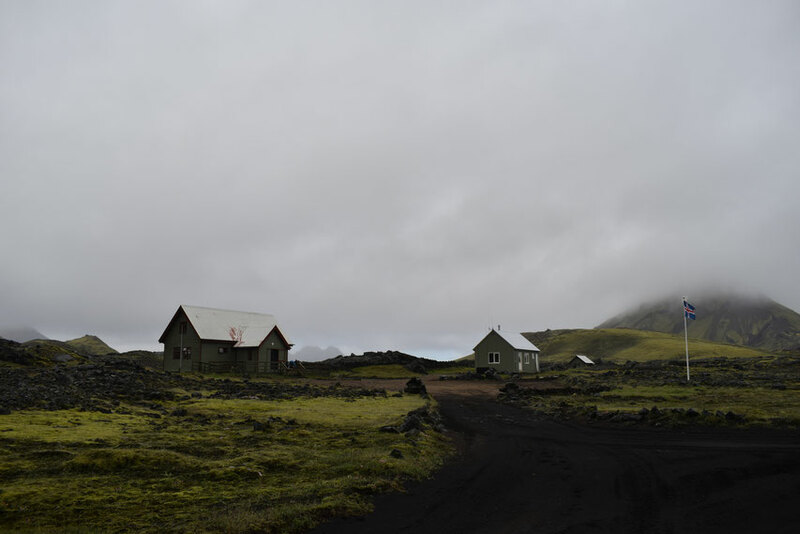 It would be easier (and a bit less weather dependant due to the altitude) to start in Þórsmörk. 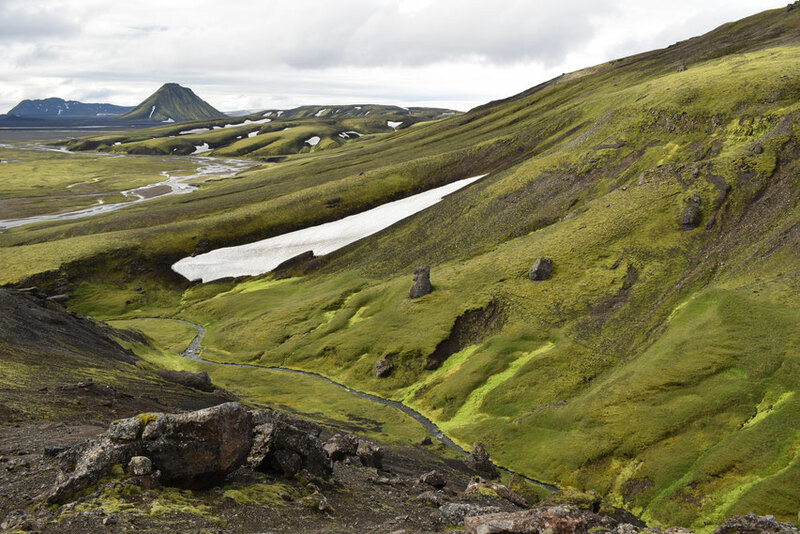 In the Summer season, the Laugavegur (from either start point) is accessible by bus which can usually be booked on the spot [though it would be safer to buy a "hikers passport" in advance]. 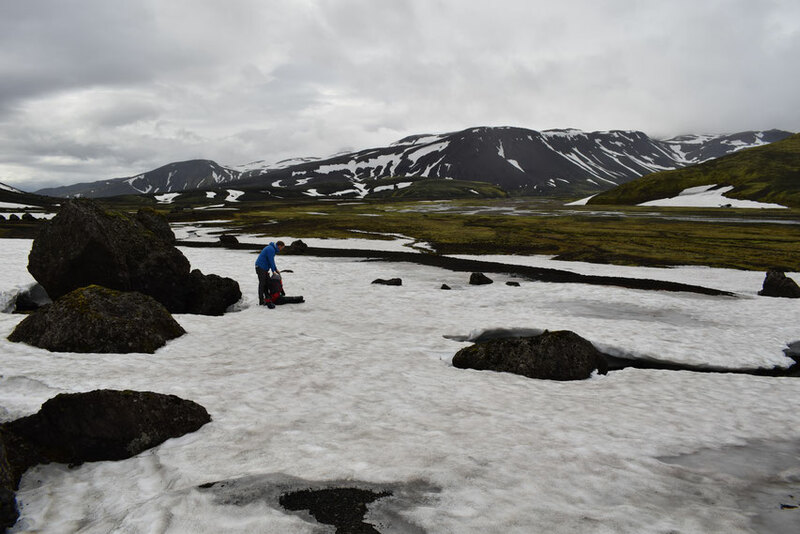 Unlike Strútsstígur, the Laugavegur is also marked, well trodden and has wardens working in each campsite, but the higher altitude in the northern half can make the weather/snow much more challenging than anything on Strútsstígur. 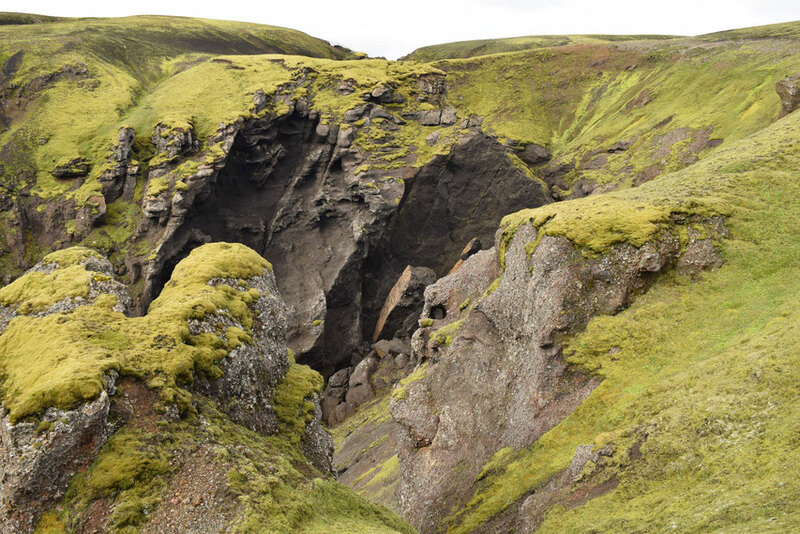 There is another (unmarked) way to walk west from Hvanngil, but I have not yet done it myself. It is sensible to allow yourself some extra time for weather problems. 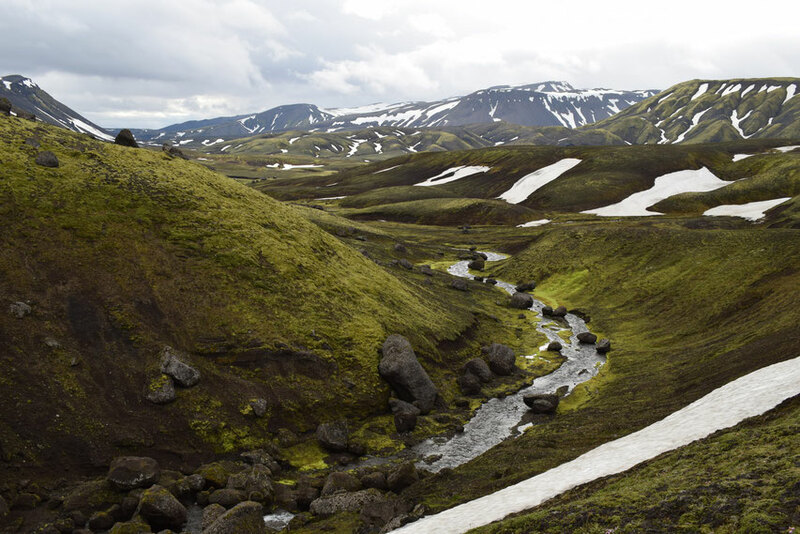 If you find yourself with a spare day, there is beautiful day hiking around Strútsskáli. I would have liked to spend two nights there. 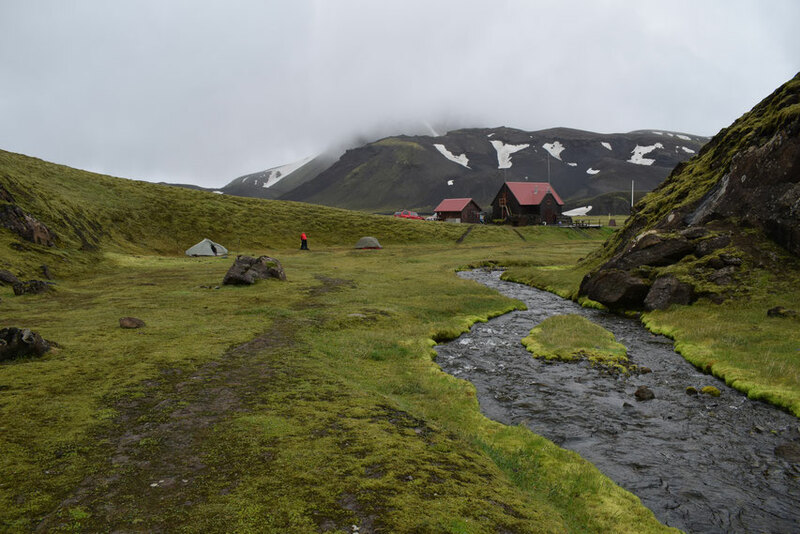 Hvanngil (2000kr per person for camping or 8500kr to sleep inside the hut). 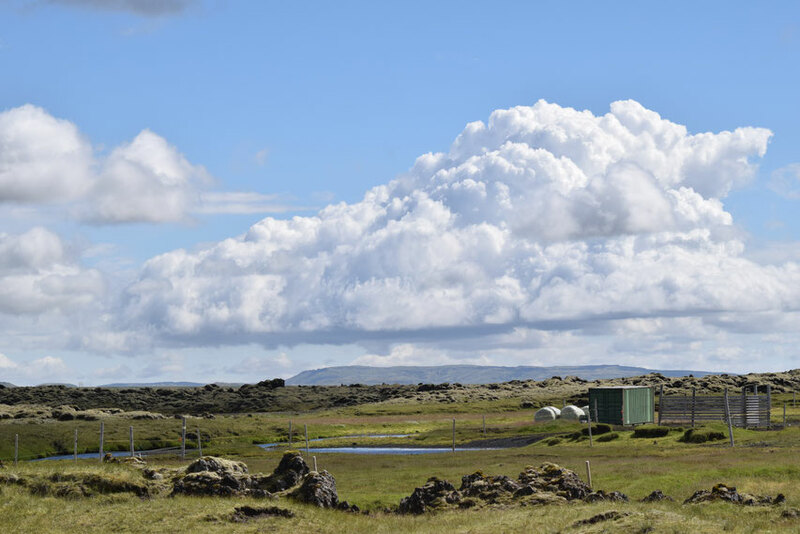 Book a space in the hut in advance through Ferðafélag Íslands. Strútsskáli (1500kr per person + 300kr tax per tent or 6500kr to sleep inside the hut). Book a space in the hut in advance through Útivist or bring cash for camping (in case a warden is not there to take your card payment). Álftavötn (1500kr per person + 300kr tax per tent or 5500kr to sleep inside the hut). Book a space in the hut in advance through Útivist or bring cash for camping. 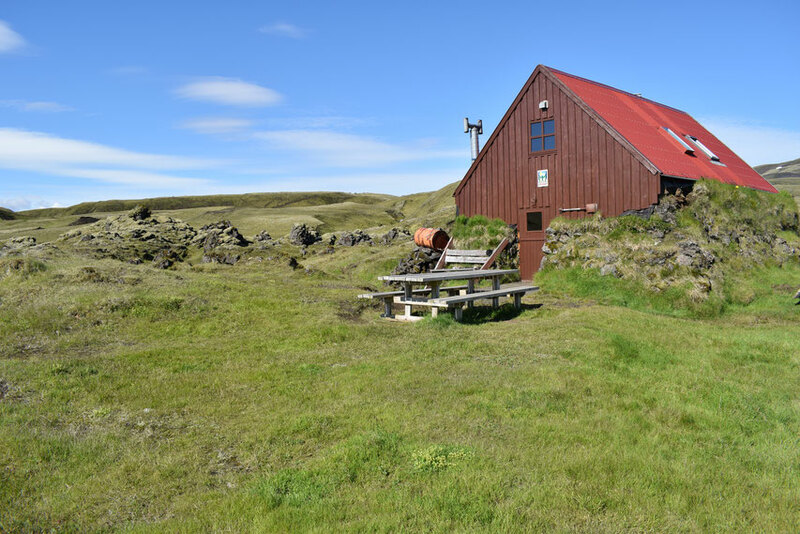 Hólaskjól (1600kr per person camping or 6800kr in the hut). 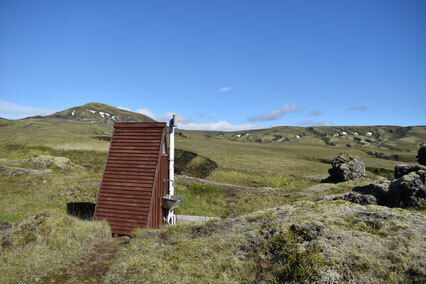 Book a space inside the hut through Hólaskjól -The Highland Center. 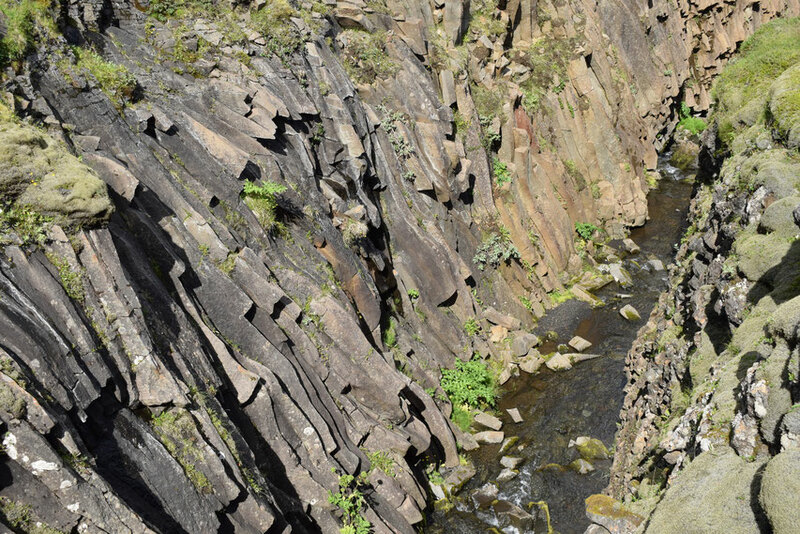 Rock formations on the banks of the Syðri-Ófæra, just beside Hólaskjól campsite.